You may have found that you buy a bra only to find that the wire is way out toward your underarm and pokes you? 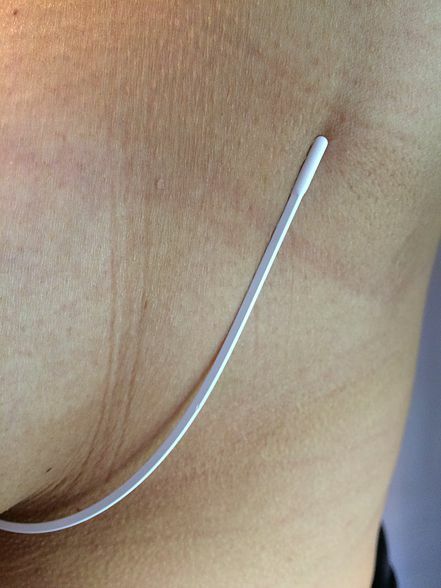 Or after a few hours (or minutes) the wire slides down your rib cage. 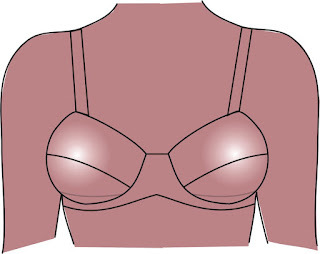 Often, there is a flat area of fabric next to the wire where the breast does not fill the cup. Yet the rest of the cup away from the wire line seems to be filled up.You can see that in this photo where the wrinkles indicate there is no breast in that area. You are an Omega and this post should give you lots of information you need…from Alpha to Omega, in fact! The Omega shape is a term I coined when I wrote the Bra-makers Manual Volume 2. 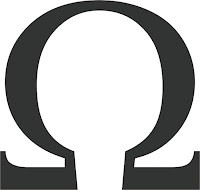 Sure enough, the Omega breast is shaped like the Greek letter omega when viewed from the top down. 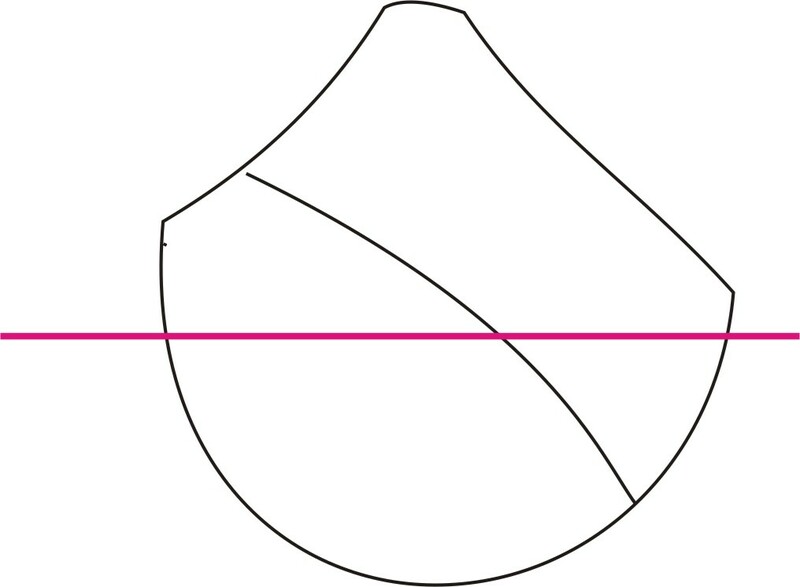 The Omega shape is smaller at the base (or root) than than the breast it supports. The normal thoracic shaping is the dotted line and the omega shape is the solid line. The Omega shape is most pronounced on a proportionately small frame with large cup sizes. It can occur on someone who has lost a lot of weight in that area. It may happen on someone…dare I say…older, who has lost of the muscle tone in the breast area. Some Omegas are flaccid but others are dense and firm. It is a shape most challenging to fit. The good news is the Alpha shape (the Classic breast shape) cup can be changed to an Omega shaped cup. Here’s how to change Alpha to Omega. CAN OMEGAS BUY RTW BRAS? 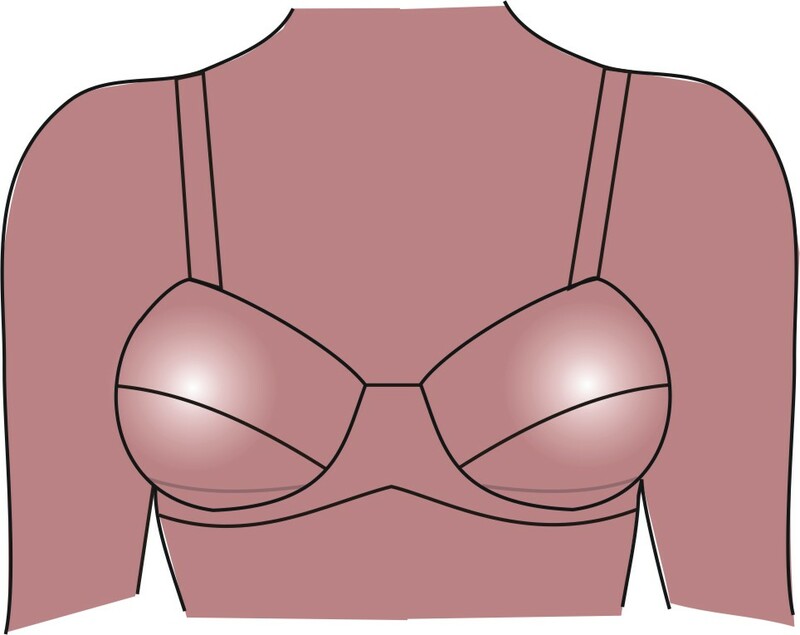 Often Omegas “solve” the problem by purchasing RTW (Ready-To-Wear) bras of a flimsy knit fabric, so that the wire more or less fits and the cup fabric (they hope) is stretchy enough to fit over the breast. As we all know by now, stretchy fabrics offer no support, so this is not a good solution. One RTW company I know of makes bras specifically for the Omega breast (Ewa Michalak), but they are out of Poland. So I bought one. You can see how small the base is compared to the size of the cup. I measured this bra to be between a 40G and a 40H in our sizing (100HH in their sizing) with a Bottom Cup Depth of 6.25″. In my Pin-up Girls patterns, the wire for that size is a #52 shown with the black tip below. 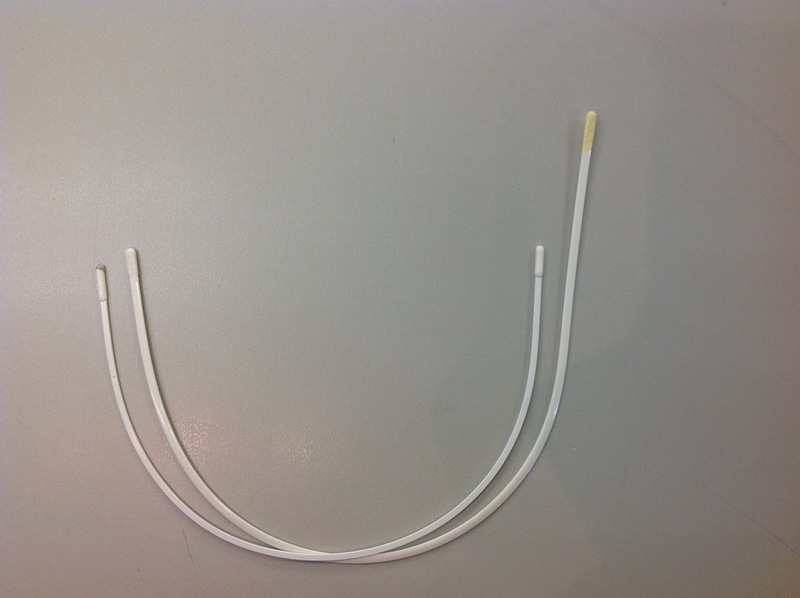 But the wire from that bra (the yellow tip) is much, much smaller and a lot taller on the side! On an Omega, that wire would fit and so would the bra cup! However, on someone who is not an Omega, they would find that wire painful to say the least. The wire actually measures to the same diameter as our #42. I’ve shown them off-set here, but you can see that even though both wires are the same diameter (size 42), theirs is much longer on the underarm side than our Super Long wire, the longest we have! If you are two or three wire sizes smaller than what the pattern calls for, you need to use a smaller frame to fit the smaller wire. Let’s say your pattern is a 38H. In my Classic Bra pattern, a 38H uses a 50 Extra Long wire. But if you are a 44 wire, that’s 3 wire sizes smaller. 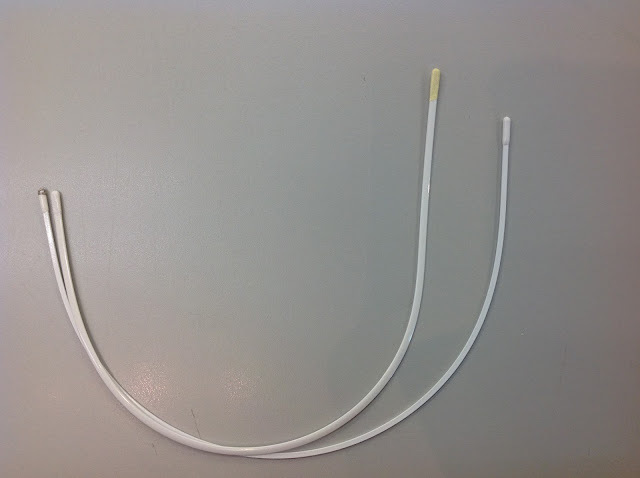 If you use the wires that are 3 sizes smaller without changing the cup, the cup will not fit correctly and you may have a flat area of fabric between the wire and the breast. The solution is to use a frame to fit the underwire size and then fit the larger cup into the smaller frame. First use a frame in your band size that is designed and sized for a 44 wire. Refer to the back of the pattern and you will see that 38E uses a 44 wire. That’s the frame you will use with the 38H cups. 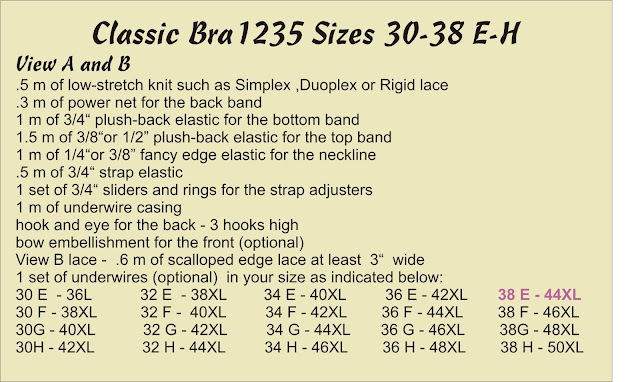 Now, if you are an experienced bra-maker, you will soon realize that a 38H cup will not fit a 38E frame. Why? Because the seam line that connects the cup to the frame will be too long. How much too short? The easiest was to find out what you are missing (and where) is to baste together a test cup into a test frame, starting from the bottom notch A and working toward the ends. What is left over at the front and the side is the amount you need to shrink. The amounts at the front and the side may not be equal, so it is best to start from the bottom and work up. 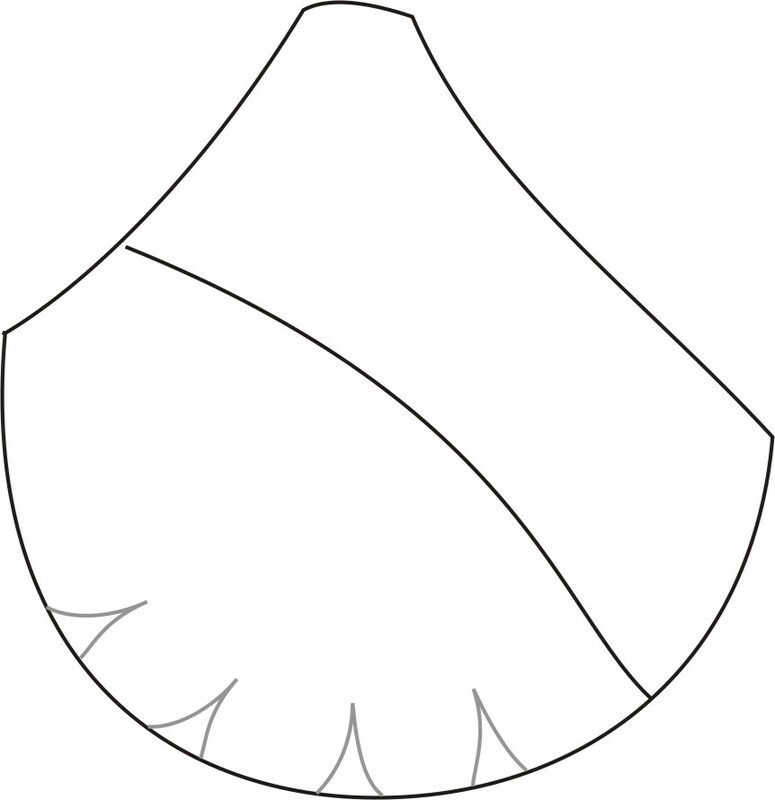 You can shrink the perimeter of the cup in several ways. Gathers are best when you have one or two wire sizes to shrink, or when there is no seaming within the shrinkage zone. Run a gathering line around the wire line, and pull the threads up gently so that the frame and cup wire lines match in length. The larger cup will now sew into the smaller frame. Strive to sew it so there are no puckers. This is very similar to easing in a sleeve cap. Steam the seamline afterward and the gathers will almost disappear. Small darts are best if you have one to three sizes to shrink. You can draw and sew a series of small darts in the shrinkage zone. Keep the darts total length about 1 – 1.5″. If you sew the darts with legs curved inward rather than straight legs of most garment darts, you will find they virtually disappear into the fabric. The best way to shrink the wire line 2 or more wire sizes is to hide the shrinkage in the seamlines. This means you need seamlines to work with within the shrinkage zone. 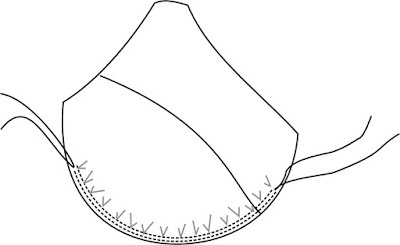 You should always consider at the very least, a horizontally seamed bra with a split lower cup for an Omega, better still would be multiple piece lower cups. The more seaming there is, the more shaping can be added. You can also combine small darts with seaming. Alpha to Omega is not that difficult once you know why and how we do it. Hopefully the Omega in your life will be much happier with her altered bra. Beverly, this blog post, chock full of information, is just what I needed to read this evening. Thank you! Thanks Beverly! See you at Stitches next year! You are most welcome, Charlene! Hi Beverly, I’ve been doing gathers for the cup but am now trying the darts! One question: what is the best way to handle the omega in a foam cup? Ladies if you haven’t taken one of the classes yet, it is so worth it! You can cut the darts out of the cut & sew foam and zig-zag the edges of the dart legs together. You won’t even notice it, except for the fit! You could do this to a certain degree in the pre-formed cups too, but I would be careful. Don’t take out too much! Hi there. I am a 46G according to the Classic Pin Up and I love the pattern. My dilemma is my breasts are Snoopy's and I also have excess tissue under my arms. The Classic is my very first bra and I just placed straps and beginning to press the seams. Very excited but also hesitant as its my first. I feel like a sewing newby all over again. Yes, Please discuss the low contour shape! There has been lots of discussion lately on the omega shape. It would be great to talk about the reverse situation. I'm just glad it now has a name!! Particularly difficult to find the right size and get support all the way around. Default seems to be the compression style – yuk. Yes, you certainly could re-shape the Kerri by curving the darts and taking more out of the bottom band. That's right…you are the low contour shape. I think I will do a blog post on it in the near future. Stay tuned! I am a me made person. Part of who I am as an artist is that I love to make everything I own. That includes ny clothes. Even under garments. If that sounds interesting to you than Beverly is the girl to learn from. Ive taken ever class she's offered in Craftsy. Go for it. It's fun! You are always so helpful, Beverly! 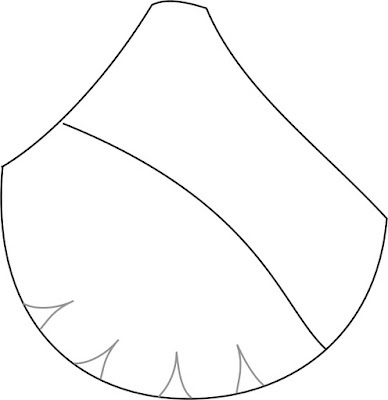 Actually I have the opposite shape – wide with a lot of tissue at the sides. I need a larger wire but reduce the cup projection, right? It would be lovely if you could tackle this issue sometime too. Thank you so much for this post. I have been sewing bra after bra for over a year. I had almost given up (considering sports bras and lycra). Now, with this information I think I can finally get it right. I was wondering if Kerri might not benefit by shaping the darts. Well because I didn't think of that 🙂 I need to rethink my starting point . Thank you. Why not clone that Ewa bra? You can remove the wire and transfer the size of the pieces to paper so you will have a pattern for yourself. I did a blog post on that subject, in the post called Cloning Ulla. I also wrote about cloning in my first book The Bra-makers Manual. This is great just what I needed to know , and now I also know why I found ewa michalak more comfortable. 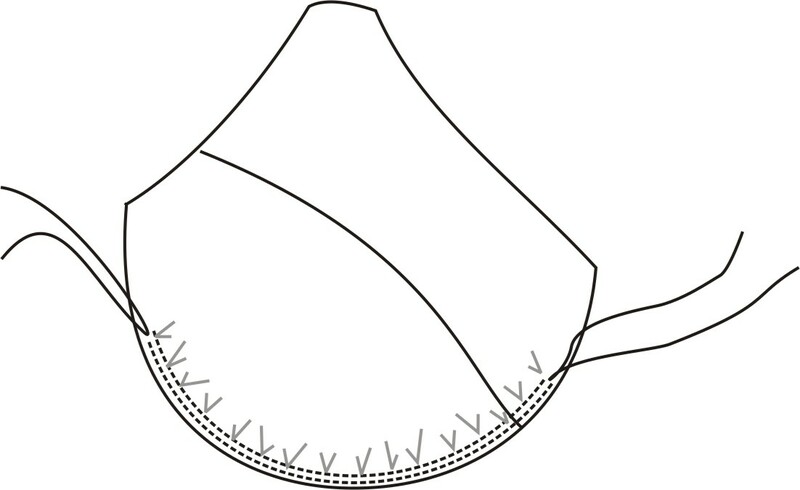 I hope that I can replicate the comfort, projection in a bra I sew myself . I really enjoyed and learned so much . Actually this is great information I never even thought about slipping out a wire from my ewa bra to see how it compares so it so very insightful. Thank you, Sigrid. I enjoy sharing these posts with other bra-makers. I know that a few years ago no one really recognized Omegas, but now even a ready to wear company is making bras for this very challenging group! I'm an omega shape (large cup, small frame) and always use a wire type that is more narrow as you describe. Though I have quite a bit of experience in bra making I always learn something from your posts. Thank you for sharing. I am so glad you enjoyed it and learned something! I thought that since there was a lot of talk on the other blogs about Omegas lately, I would do a post about it, I am pleased with the response it's getting! Awesome post, Beverly! Just awesome! So much great information here, and you've been so tremendous in helping me fit my Omega shape. Thank you!